The school holidays may be over, but this doesn't mean that your outdoor time has to come to an end. Experts agree that children need at least one hour of outdoor time a day to improve their muscle tone, physical coordination, sense of balance and general health and fitness levels. Outdoor time helps children unwind and relax. Unfortunately, for many children living in urban and residential areas, 'outdoor time' consists of structured physical activity such as taekwondo, swimming or tennis lessons. While all sports and physical activities are good for you, unstructured free play outdoors helps to develop your creativity, self-confidence and problem-solving skills. Many children look forward to road trips, camping excursions and visits to national parks and places of natural interest during the school holidays. This does not have to come to an end when the new school semester begins. 'Microadventures' are short adventures in the great outdoors, as opposed to 3-day camping trips in Taman Negara or Tasik Chini. They are usually day trips or may be only hours long. Sometimes they are overnight weekend camping trips that involve camping out on Friday or Saturday nights. What makes a microadventure a microadventure is that they have to be generally unstructured. A sunrise hike up Broga Hill is a microadventure. A birdwatching workshop is less so, because it is structured and involves other people advising you on what to see and do. A football training session is an outdoor physical training session without being a microadventure at all. 8. A change of clothes in case of bad weather or if you are sleeping out. Field guides, binoculars, log books, compasses, torchlights and other such items are optional. 1. Set a goal of going on one microadventure each month, if doing it every weekend seems too challenging. 2. Ensure everyone -- adults and children alike -- get one hour of Outdoor Time each day. Tick it off on a chart, calendar or whiteboard to ensure this is done daily. This can be a nightly walk around the neighbourhood after dinner instead of sitting down in front of the computer, tablet or TV. 3. If your daily outdoor activity consists of going to the neighbourhood playground, playing in the garden or swimming in the apartment pool, set a goal of going to a different playground or park in a different neighbourhood once or twice a week. Explore different parks and playground equipment. One family wrote a blogpost on how they spent the entire summer exploring and testing out all the slides in all the playgrounds in their district. 4. Set a Family Goal for the month or quarter (i.e. every 3 months), for example: (i) One place with water; (ii) One place we have never been to before; (iii) One overnight weekend stay; (iv) One item on the MNS Newsletter activities announcement page; and (v) One new way of travelling. To make it more meaningful for the family or as a group activity, you can add a volunteering component to your microadventures. 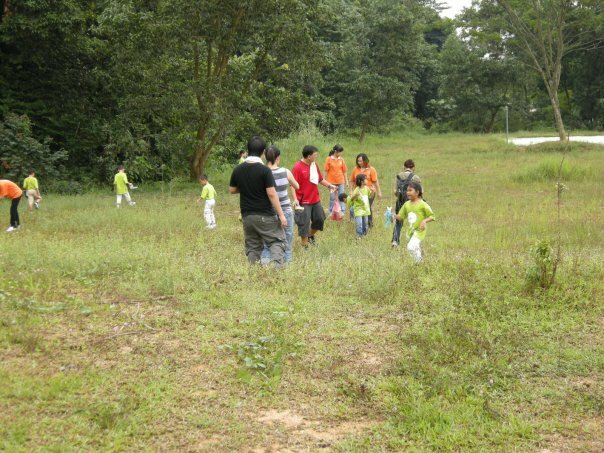 For example, you can volunteer for worthy conservation causes, such as the Malaysian Nature Society Urban Community Forest (UCF) plant nursery for the first two hours and then spend the third hour exploring the trails. 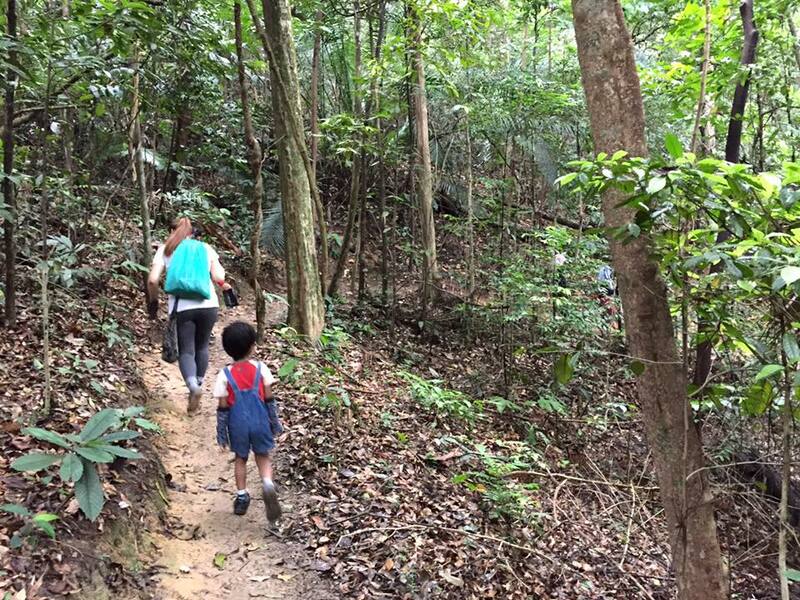 You can volunteer with the Eats, Roots and Shoots Edible Garden in Petaling Jaya and then spend the next hour hiking the Bukit Gasing Trail. You can help to clean up parks and nature trails. Here are suggestions on microadventures you can try out in KL and Selangor:1. 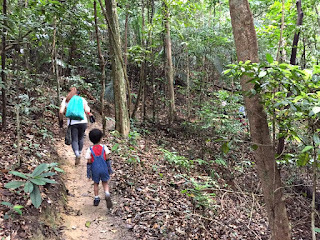 Explore the KL Forest Eco Park (also known as the Bukit Nanas Forest Reserve) and try to locate the suspension bridge that takes you to the hidden playground. 2. Explore the trails and streams of Forest Research Institute Malaysia (FRIM), Lembah Kiara Park in TTDI, Bukit Gasing Forest Park, Ketumbar Hill, Broga Hill or Templer's Park. 3. Go on a long bike ride and picnic at Taman Botani Negara Shah Alam (commonly known as Bukit Cherakah). 4. Take the bus or LRT to a different part of town and walk home without the use of Waze, Google Maps or any other mobile apps. 5. Go rafting, kayaking or paddleboarding. 6. Explore the playgrounds at Desa Park City, Bukit Jalil Recreation Park, KL Lake Gardens, National Science Centre and Perdana Botanical Gardens. 7. Fly a kite at the Kepong Metropolitan Park or Morib Beach. 8. Bring a brew kit on your next hike and practice starting a fire and boiling some water for tea when you stop to rest. Learn to cook yourself a simple meal outdoors, e.g. instant noodles or toasted sandwiches, once you have mastered the art of starting a fire and keeping a fire going. Remember to put out your fire completely and bring your litter out with you when you are done. 9. Bring a container of plain flour with you. Work in teams of 2-3. The leading team leaves a pattern of flour on rocks and the trail as a trail marker and the 'hunting' team starts off 5-10 minutes later and tries to catch up with the leading team by following the markers. Please do not use bits of paper, crayons, marker pens or non-biodegradable materials as trail markers. 10. Explore the Kuala Selangor Nature Park and go to Kg. Kuantan after nightfall to see the fireflies along the Selangor River. 11. Go birding, caving or herping (i.e. 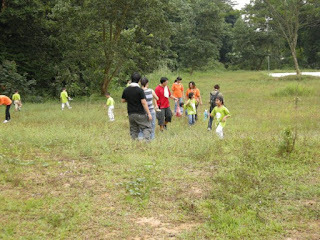 looking for and spotting reptiles and amphibians) with the Malaysian Nature Society Special Interest Groups. 12. Go on night hikes and night walks to build up your self-confidence and sense of balance and spatial awareness in the dark. 13. Have a scavenger hunt on your next hike or park outing. Participants can use their phone cameras to capture photos of things on the list, for example: 'something with wings', 'something with a shell', 'something with more than 6 legs', 'something man-made', 'something that looks like a human face', 'something red' and 'something not native to the area'. 14. If your microadventure consists of going to a playground, urban park or a place to volunteer (e.g. an animal shelter, a community garden, a plant nursery or a homeless assistance centre), add the element of adventure and novelty to it by going there using a different mode of travel (e.g. LRT, bus, on foot, by bike, or on a scooter or skates) or using a different route, and then finish off with an outdoor picnic meal, or a meal at a restaurant you have never been to, particularly if it serves cuisine of a different culture. 15. Check out the city and community pages of the newspaper or events near you on social media to find out about local events with a community service or environmental objective. For example, environmental documentary screenings, organic markets, art fairs, school fundraisers, treasure hunts, recycling campaigns and community cleanups. Participate in the activities to learn more about these causes and your local community. Make new friends, try new foods and learn new skills and games. 16. If it is raining but there is no lightning, put on a raincoat and go out in the rain. Watch where the water flows. Are there any birds or animals that go out in the rain? 17. If you live in an urban area, take the LRT, monorail or some other form of public transport to visit a place of historical interest, for example, the old part of Kuala Lumpur, around Masjid Jamek and Central Market. Make notes and sketches about things you observe and how they make you feel. Ride the LRT all the way to the end of the line and back. 18. Sleep out in your garden, and once you have done this, try out other friends' gardens, the local playground and the school compound, a little further away from your home each time.